Rob Sanders Architects featured in Connecticut Cottages & Gardens! Discover how RSA, along with the added talent of interior designer and artist Ginny Awn, transformed a 1920s gentleman’s barn in Wilton into a “rustic modern” home! 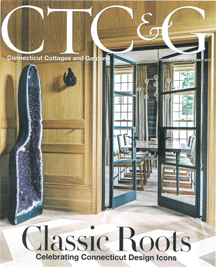 Click here to open a PDF of the article “Change Agent” in the September 2016 Connecticut Cottages & Gardens (PDF) or click here read it online on the CTC&G website.